We would like to apologise for the gap in the weekly what’s new, we have lots to cover and will continue to keep you posted with updates in the coming future. Next year we are hosting and organising several events such as Genocide Memorial Day, a special screening of the new IHRC Film ‘Zone of Non-Being: Guantanamo’ and Islamophobia Awards. Keep checking back on our website for further updates and news on these events. We have a promotional offer of 20% off Decolonising Education Pack – Back in Stock, hurry while stocks last. We will ship worldwide, and you can pay by credit or debit card or PAYPAL. IHRC concerned about knee jerk reactions. IHRC is concerned by some of the knee-jerk and tendentious reactions arising from the convictions of Fusilier Lee Rigby in Woolwich last May by people claiming to be “soldiers of Allah”. Politicians, pundits, the media and the anti-terrorism industry appear to be exploiting the public revulsion generated by the case to press for another government crackdown on the Muslim community. Malaysian ruling party wants to amend constitution inserting the term Sunni after the word Islam as official religion. We regret the suggestion by the Deputy President of UMNO Tan Sri Muhyiddin Yassin to amend the Federal Constitution to guarantee that the teaching of Ahli Sunnah Wal Jamaah is the faith of Muslims in Malaysia and we appeal to him to reconsider it because it has serious implications on Muslim unity and Malaysia’s international commitments. FCO failure to support Abbas Khan not unusual. IHRC finds entirely plausible the criticism being made of the Foreign and Commonwealth Office that it failed to do enough to support and secure the release of British doctor Abbas Khan who died this week in Syrian custody. News reports this morning stating that the government is preparing to introduce a raft of further measures to tackle Islamic extremism represent a new attack on the British Muslim community and civil liberties. Abdel Kader Mullah’s hanging politically driven. IHRC strongly condemns the execution last night of the Bangladeshi opposition leader Abdul Kader Mullah. IHRC is dismayed by the UK Home Secretary’s continued attempts to strip a UK national of his citizenship despite having already had the decision overturned by the Supreme Court. 20% off, so hurry while stocks last. 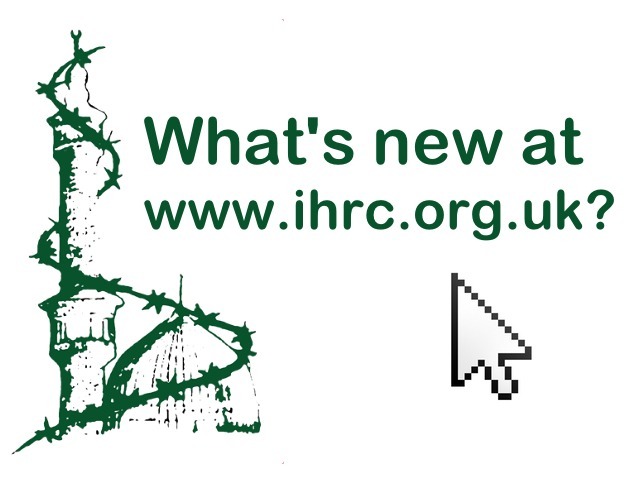 IHRC is happy to inform you that the Decolonising Education pack is now back in stock. The pack is being sold at a 20% discount than if the items were bought individually. We will ship worldwide, and you can pay by credit or debit card or PAYPAL. From 19 September 2013 to 18 February 2014 drop by if you are in the area. IHRC is delighted to host visionary photographer and artist Nasreen Shaikh Jamal al-Lail’s work at its gallery in Wembley, northwest London. Join us in the hall or on-line for GMD. Streamed live on www.ihrc.tv This year, simultaneous events will be taking place in Paris and Amsterdam. 8 January 2014 @ IHRC, 202 Preston Road, Wembley, HA9 8PA, UK. A film written and directed by Turab Shah and produced by Islamic Human Rights Commission. IHRC will be holding an exclusive screening at the IHRC Bookshop and Gallery of a director’s cut of this important new documentary produced by IHRC, followed by a Q & A session with the producers, activists and authors working on issues related to the content of the film. Join us for the one off event starting at 6.45pm, or watch the Q&A session live from 8pm GMT on Wednesday 8 January on www.ihrc.tv. If you want to attend the screening, please emailevents@ihrc.org to confirm your place. A seminar with Professor Ramon Grosfoguel. Listen to the seminar on Cartographies of Power as part of the series of events at IHRC with Professor Grosfoguel, a leading scholar of decoloniality, who joined us on 9 December 2013. Listen to his seminar here. A video of his second event ‘Decolonising Post-colonial Studies and Paradigms of Political Economy’ will be available shortly. Images from the upcoming IHRC Film in 2014 by Turab Shah.